Ever since I got married I’ve found that my craftiness comes in waves. I was really into crocheting for a while that summer, fell out of it, fell back into it, rinse and repeat. I made learned how to make socks and made two pairs before falling out of that, I made a ton of doilies at one point for people, I was into making lace earlier this year, but I’ve been in the midst of a dry spell recently. I kind of wanted to be crafty, but I didn’t know what to do. I find that making things for myself doesn’t usually pan out. There isn’t sufficient motivation there to finish. I tried making myself owl socks once but I kept messing up the top so I gave up. So I need people to make stuff for and recently it finally occurred to me that I have several tiny people to make things for. The thing about going to Geneva, as you all know, is that when you graduate all your friends get married and you end up attending eight weddings in one summer. The other part of that is, however, those friends that got married start having kids after a while and then you have all the babies. I have two friends now who are expecting their first babies in the fall, one is having a little girl and the other is having a little boy, so I’m basically set on a need for tiny baby things. It only took me until I got an invitation in the mail for a baby shower this weekend to realize that I could make baby booties and baby hats and probably baby clothes if I had enough time and will power. My aunt Mel has knitted some super intense christening gowns for her granddaughters. I don’t think I’m going to be able to do that level of work, but I’m sure there are some fairly easy patterns on Ravelry I could find and muddle my way through. I’m pretty pumped about making baby things this summer. I’ve kind of always wanted to, but never had an excuse. I mean, sure, my cousins have lots of babies, but we also come from a super crafty family and it’s intimidating to try and make something for someone who is also going to get like a million better made things from their mom-in-law, or sister-in-law or aunt. Seriously, my aunt Mel is crazy talented with those knitting needles, and basically anything crafty. She made me Irish lace for my wedding headpiece and it was basically the most beautiful thing ever. So yeah, that side has the homemade gifts covered, but now I have friends who are having babies and I have no idea if they have crafty people to make them cute baby things. Will they be swamped with homemade booties? Possibly. Will they all be from me? Also possibly. We shall see! I’ve found that booties are super easy and also super cute, so those are definitely a thing I will be making a lot of. There are also a lot of baby sandal patterns on Ravelry so I might give those a try too. Hats are a thing that I have tried before and for some reason can’t get the hang of, but I’ll try again, for the sake of providing a full set of accessories. I won’t be able to try any clothing for the shower on Saturday, but I will have all summer before she’s born, and I’m sure little girl clothes can be sent easily through the mail. I’ve managed to send one whole package already and it made it to the place it was going, so I’m pretty confident I can manage it again. Most of it will probably be crocheted as that’s where I seem to do the best. 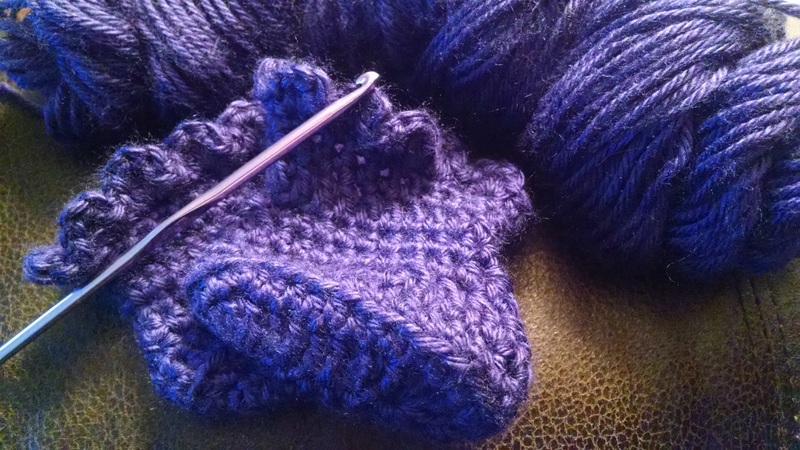 I can knit and I’ve done pretty well at it, but it’s more complicated to me and harder to fix. I might give baby socks a try, though, just for the fun of it. So my week will be filled with tiny baby crafts and we’ll see how long I can stay on this crafty kick. I’m hoping having a few months won’t trigger my procrastinator instincts. I’m a terrible procrastinator, if I have the time, I’ll waste it. Hopefully I can get myself into gear with this and turn out some nice things for my future friends to wear. Right now I’m super excited about the idea. Let’s hope it stays that way. Have a lovely day, my friends.